Last weekend they were predicting snow by mid-week and here we are on Wednesday with the snow coming down light and wet. This, combined with increasingly warmer temperatures that are predicted for the coming days, could make for some interesting conditions at Stillwell Woods on Sunday. 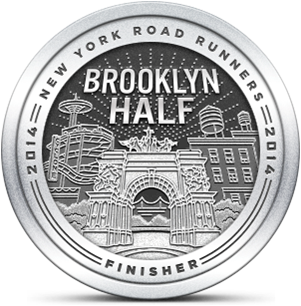 Yesterday I was speaking to my friend FS who recently ran a 10 mile NYRR race in Prospect Park. She predicted that Sunday's course will be very muddy. I hadn't thought about that because I was focusing on conditions related to snow. But mud is much more likely. I'm not really sure how I should handle the run in that case since my experiences with mud are limited to navigating around large puddles on the paths. I've always run around, rather than through those areas, because I don't have waterproof trail shoes. I'm hoping that my HH Trail Lizards will hold up under extremely muddy conditions and I'm slightly worried that running in mud will make a tough course even tougher. Then again, if it was easy why would we do it? I'm getting to the end of my race training and this morning I ran 2.4 miles and felt great throughout the run. However, I'm realizing that those Old Navy RECTECH shirts are cheap for a reason. While they are lighter and provide less friction than cotton they collect sweat like cotton. After today's session I've decided to relegate them to outer layer status and use them for their bright color rather than their wicking performance. 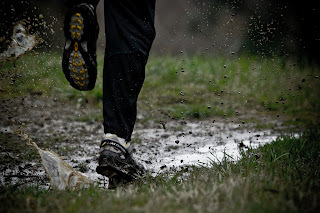 Good photo--the runner is wearing the Salomon trail runners I love! Have a fantastic time at the race. The mud should be exciting, and it'll help take your mind off how you're performing. I wish I had a pair of Salomons for Sunday!